As a dietary supplement, mix one serving of 5 grams (one scoop) into at least 16 ounces (500 ml) of water or suitable beverage and drink within 15 minutes. Consume one serving per day. For best results, use this product as part of a proper diet and exercise program. Watch Mike use NutraBio's 100% Creatine Monohydrate to prove it's not bad for keto dieters - superb quality from NutraBio! MICRONIZED HPLC LAB TESTED, and 3rd party lab tests now available! 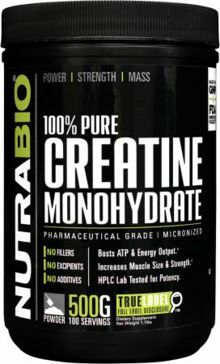 Since 1996, NutraBio has sold only the purest creatine. Every batch is tested by independent labs to be at least 99.9% pure or we won't ship it to you, that's our quality commitment. Creatine is a precursor to the bio-energetic fuel creatine phosphate, which replenishes cellular ATP (adenosine triphosphate) levels during maximum intensity contractions. Supplementing with creatine can increase levels of creatine phosphate in the muscle improving work output capacity, power, recovery and muscle hydration. When muscles are hydrated, muscle catabolism (breakdown) is minimized.